Babies are so tender and it is understanding that parents the world over want to make the best choices for them especially when it comes to skin care. 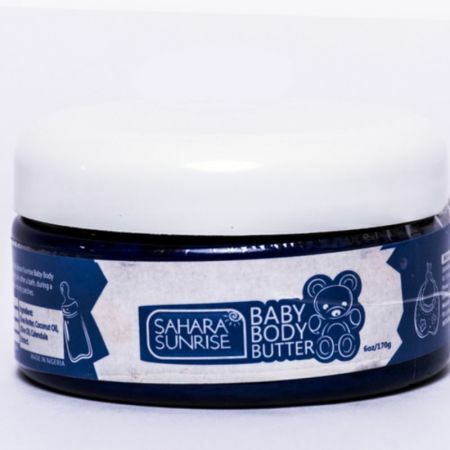 At Sahara Sunrise we are acutely aware of this fact and have come up with the Sahara Sunrise Baby Butter, which is a perfect blend of natural oils and extracts formulated to keep your baby’s skin the way it was intended – soft, smooth, tender and well moisturized. It is designed to protect your baby’s skin against dryness and rough and flaky patches. Here’s what we’ve included in Sahara Sunrise Baby Body Butter and why: Shea Butter is a vegetable butter that has been used for centuries because of its excellent ability to protect and maintain the skin, hair and nails. It is the nut of the Shea tree that grows uncultivated in mostly the West African region. The trees grow up to 100 feet tall and can take about 30-50 years to reach maturity, however; they bear their first fruits at about 25 years(at Sahara Sunrise we believe that anything that takes that long to prepare itself must be extremely good). It is loaded with natural antioxidants (vitamin E) that go after free radicals that attack our cells. The fatty acids, triglycerides and phytosterols in Shea Butter promote cellular growth. The Allantaoin in Shea Butter stimulates the skin’s natural renewal process. Shea Butter also provides protection from UV rays 275nm; and the Resinous Esters provide healing and disinfecting properties. Shea Butter contains three key vitamins: A, E and F. Vitamin F is commonly known as a fatty acid. Its primary function is to maintain the function and integrity of cell membranes. This vitamin is excellent for combating diaper rash. Shea Butter gives your skin that healthy glow and rejuvenated look and feel. Due to its low fat content, it penetrates your skin with ease without clogging your pores and without build-up. Shea Butter penetrates deep into the skin to hydrate and promote cell growth. It retains moisture in the skin lipids to improve elasticity. Coconut Oil has anti-inflammatory, antioxidant and antibacterial properties. Coconut oil like Shea Butter does not just sit on the surface of the skin but penetrates the layers of the skin and is easily absorbed by the skin. In this way it is able to deliver its nourishment and healing properties deep into the skin layers. Coconut Oil is a light moisturizer and we recommend that it should always be mixed with a deep moisturizing oil or butter especially for dry patchy skin. Olive oil helps to regenerate skin tissues, it increases collagen and elastin production. This gives the skin a healthy,smooth, youthful and shiny look and feel. It is rich in healthy fats, phenolic anti-oxidant Vitamin E, squalene and oleic acids. Olive oil is easily absorbed by the skin and this makes it an excellent moisturizer. It has natural lipids which contribute to sebum production, the natural oil produced by the skin. Ingredients: Shea Butter, Coconut Oil, Olive Oil, Calendula Extract.